Well, you may not have noticed my absence, but I've been missing you all. The kiddo and I are recovering from another nasty stomach bug we had over the weekend. Between that, a trip to the dentist to fill a little cavity, and four nasty blisters I got today from wearing my high-heeled sandals (I knew I would be walking all the way across town - what was I thinking? ), just a normal day (Tomorrow? Please?) will feel like a lovely vacation for us. 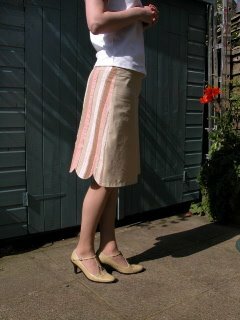 So let's get to the interesting things first: Caroline sent photos of her scalloped hem skirt. Isn't it terrific? I love her fabric choices, and I can't begin to tell you how thrilled I am that some of you are actually using the tutorial. Oh, did you notice those gorgeous shoes? I'll bet Caroline doesn't go traipsing off to the dentist in them, unlike some of us. 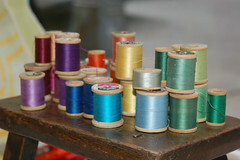 When Joelle opened Purl Patchwork, she had a terrific little window display featuring wooden spools of thread. I thought it was charming and took some photos of it. And then I found all those wooden spools at Grandma's apartment. 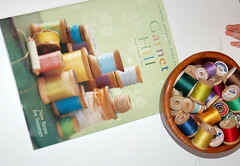 And finally, the new copy of the Garment Hill catalog arrived. That did it. 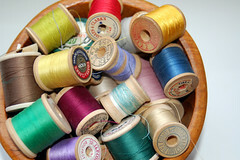 My little spools needed some camera time too, just because I like them so much. So there you have it. My record of time poorly spent. Maybe tomorrow I'll have some real content, or at least something interesting, to blog about. Until then, I'm planning to watch Memoirs of a Geisha and work on my sock tonight. I promise, it's going to feel like a night on the town, comparatively speaking. So pleased to see that I'm not the only person who plays with old spools of cotton!! 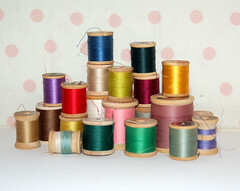 What lovely and well-behaved spools! I am particularly taken by the periwinkle in the far-right of the last photo. I love her little swimsuit--just the right proportions to preserve modesty and propriety. But where is her sunhat? Oh no, that looks like time very well spent, in my opinion! I feel it... we all just get the urge to style a photo. I mean, sometimes, it just has to happen, right? Well done! Oh it is lovely! Is there a link to the tutorial? I'd like to try. That's a great skirt, I love the colors. In kindergarden, my children had an venerable teacher whose signature Christmas idea for the little ones was to make ornaments from wooden spools of differing sizes. She gave them the spools, some glue, pipe cleaners, and little plastic crystal beads and let them go for it. I can't tell you how hard it was for me to find those spools but those ornaments are the ultimate treasure on my tree every year. I do the same thing with photos but thats how you get good shots--playing around! And don't you just love Garnet Hills photos? My other fave is Anthropologie. Their catalogs and photography are gorgeous! geesh... i love wooden spools too! i was so bummed when i found out i really shouldn't use the thread because there goes my justifiable reason for snatching them up when i see them!